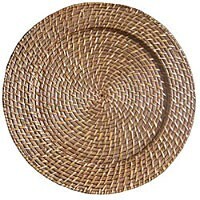 Home > Products > ChargeIt by Jay Round Harvest Amber Rattan Charger Plate 13"
This item will be back in stock July 15th. Order now to reserve. Add a natural, tropical touch to outdoor table settings or themed receptions with the ChargeIt by Jay Round Harvest Amber Rattan Charger Plate 13". Boasting an intricate thick weave, this product exudes a sense of nature and warmth while providing a striking backdrop for bright white dinnerware or glazed ceramic pieces. Made from high quality rattan, it is exceptionally durable for years of repeated use. Designed for aesthetics and functionality, this charger also protects against spills and mess that might otherwise stain your tablecloth. After use, simply clean this charger plate with a damp cloth.